Sign up for free and just shop with Levi's as normal. Our average member earns over ₹5900 cashback a year. LEVI’S – The revolutionary jeans garment that has existed even now since 1853! It was originally produced for mine workers as a uniform. This amazing heritage is the most important apparel in everybody's life. A pair of Levi’s jeans is like your best friend whom you can always rely on. Levi’s jeans are well known for their cutting-edge style, comfort, and diversity in their fit. The creator behind this classic jean is Levi Strauss who came from Bavaria to San Francisco, California in 1853. He came with the motive to start a west coast branch of his brothers’ New York dry goods business. Two decades later, a tailor named Jacob Davis from Nevada wrote to Levi advising him to get a patent on copper rivets which can be used for pants. And this led to the birth of the 501 Levi’s Jeans which was manufactured in the 1890s. From then until today, Levi’s jeans have been evolved and blended into a modern style with a note of legacy to it. Everybody loves Levi’s denim because the comfort and feel it gives is nowhere else! A blue jean paired up with a plain white tee will always be the look to die for! At Levi’s online store you will find denim, tops, and accessories for men and women with extensive style fit and color. Be it boot cut, skinny fit, cycling shorts or boyfriend jeans, Levi’s online store is a one-stop destination for all the fashion mongers. Get a pair of new jeans at Levi’s online store and avail cashback on Levi’s products at Topcashback. Go grab now! Find discount up to 50% at Levi’s store online on Men and Women collection. Become a Levi’s Loop member and earn reward points on all your shopping. To get the maximum benefit of your online shopping gets cash back on your purchase at Levi’s through TopCashback. From 1853, Levi’s jeans have made bold changes in terms of design, style, and material. But the quality of the jeans has never faded till now. Among the many thing’s men prefer, quality is the one. And Levi’s is all about quality! Whether you are looking for a storm rider look or casual date look, every style is curated carefully for your needs at Levi’s store. You get a variety of Men’s clothing includes men's jeans like Slim fit, Regular fit, regular tapered and skinny jeans. Also, Levis vintage collections, Casual shirt, t-shirts, jackets, shorts, leather belts, casual shoes, flip flops and much more are available. Tapered fit jeans by Levi’s is a solution to your everyday fashion problem. Also, be bold to try out some retro looks like boot cut jeans by Levi’s jeans. Are you high on sports? Then check out these super-flexible joggers and polo T-shirts that make you look so good! Like men, women also love to have a cozy pair of fitted jeans that goes with every top and T-shirt. When you think of buying jeans the first thought you get is about fitting. You ladies know when it comes to body fit jeans, no one does it better than Levi’s. Choose jeans to fit from a wide range of styles like a super skinny, skinny fit, slim fit, tapered, regular taper, straight fit and wide leg. A pair of jeans only will not satisfy any women’s wardrobe need. So, keeping that in mind Levi’s online store brings you tops, T-shirts, dresses, jackets, coats, and accessories for you. And for the beautiful curvy women’s, Levi’s has jeans that are distinct according to your curve ID. So much good stuff all at one place! Amazing right? 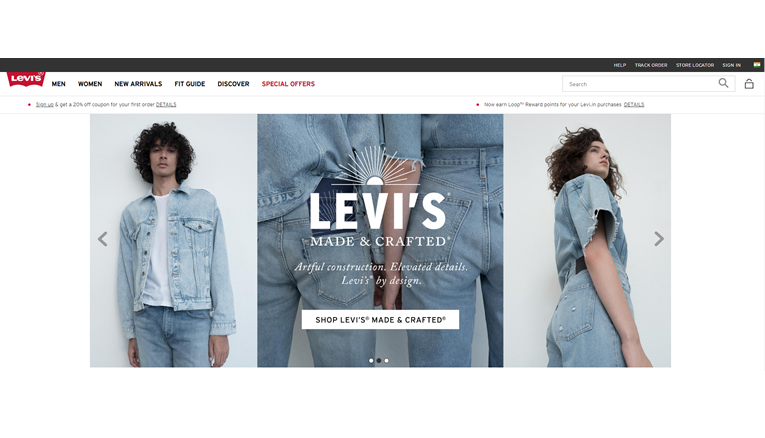 Go check out Levi’s online store and we guarantee you won’t leave without filling up your cart! We all love cashback more than discounts, don’t we? They act as an incentive on the discount which is free money on your online purchases. At Topcashback we promise to give you the maximum cashback on Levi’s products every time you buy! Become a member and get benefits of cashback on 500+ retailers at Topcashback. Signup and get your first cashback now! The Levi’s® brand is just part of the story. Levi's is also home to Dockers® and Denizen® with some 500 stores, and products available in 110 countries around the world.